Where to go before a show? That’s always a tricky question for us. Do we do the formal thing and go have an expensive meal before a theater show or do we hit up a bar and order a pizza? Well, if you know us, more often than not, it’s going to be the bar. We’re still not really familiar with Kalamazoo or Western Michigan yet and we haven’t really checked out campus. Just doing a quick Internet search brought me to a pub just down the street from Miller Auditorium. They had some good looking sandwiches and of course, pizza. Sounded good to both of us. 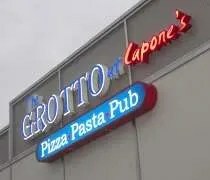 The Grotto at Capone’s is on Michigan Avenue near Howard Street in the Campus Point Mall. There is an entrance on Michigan Avenue, but the parking is around back. There’s also an entrance from the parking lot. Either will work…just depends if you’re walking from campus or driving. Since we were driving, we needed a place to park. I got a little worried when we walked in. The Grotto at Capone’s is a pretty typical college bar. There’s a huge bar with a number of LCD TV’s hanging. There’s also a few pool tables near the door next to the road. The rest of the space is sparcely populated with tables and booths. There is a lot of empty space which is probably great on a big drinking night, but scary on a dining out night. There’s also a downtairs with a sign that says “The Grotto.” It was roped off, so I really have no idea what is downstairs. The bartender greeted us as we walked in. We grabbed a pub table and waited a few minutes. I didn’t see a waitress and I was only going to give it ten minutes or so before coming up with a plan b. My fears were for naught. A waitress came out of the kitchen with menus and silverware. She took our drink order, Coke and a Diet Coke, told us about a pizza special then went to another table that just sat down while we made up our minds. I was going to order a sandwich, but the pizza special was too good to pass up. We ended up ordering a large pizza (which was only $7.99). We split the pizza into half cheese, half pepperoni so I could get some meat. 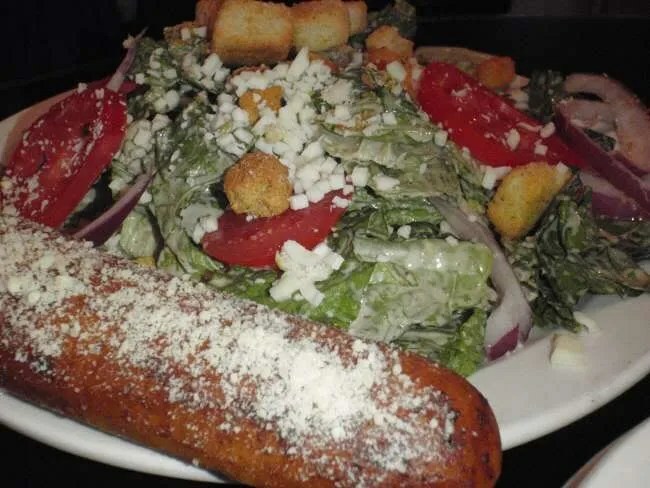 We also ordered Capone’s Sticks and J got a House Salad. The salad came out first. It was a huge pile of mixed greens with tomatos, cheese, and croutons with the house Italian dressing and a breadstick. I’m not sure I’ve ever said a salad looked good, but this one looked good. As J was finishing up her salad. The Capone’s Sticks came out. When we ordered them, we both were expecting breadsticks. That’s not really what we got. 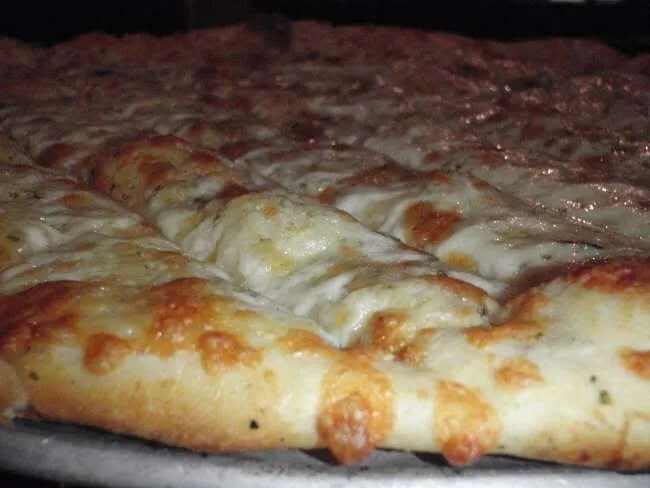 The appetizer is actually a pizza crust that is topped with cheese and baked. I’d compare them to Little Ceasar’s Crazy Bread, but much, much better. The sticks came with a cup of ranch and marinara for dipping. We polished off the whole tray….while, I did most of the damage. J was saving room for pizza, but in typical me fashion, I filled up on the appetizer. The pizza came out about ten minutes later. 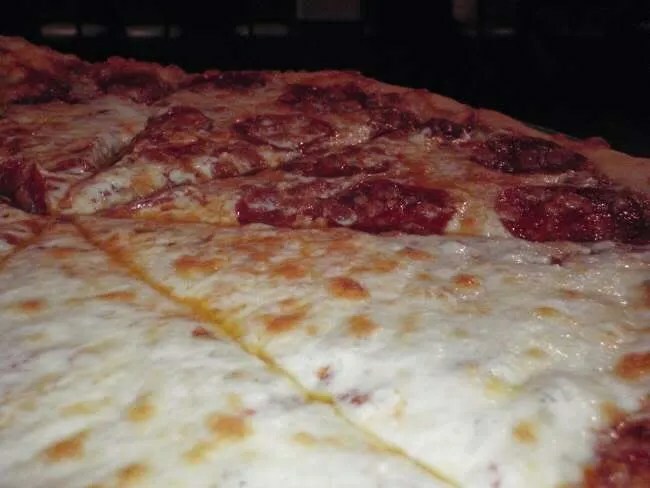 The Grotto has both a thin crust and a Chicago-Style deep dish. I try to not order a deep dish anywhere but Chicago and we’re more fans of the really thin, crispy crust anyway. This pizza was not quite a cracker thin crust, but it wasn’t the generic chain crust either. The edges were crispy and buttery. The bottom crust was a nice golden brown, but it was still pretty limp. The pizza was so hot when it came out, we had to use a knife and fork until it cooled down some. It was a very tasty pizza, but didn’t have the “wow factor” or anything that would make it stick out. I would order it again and most definitely order over a chain pizza. 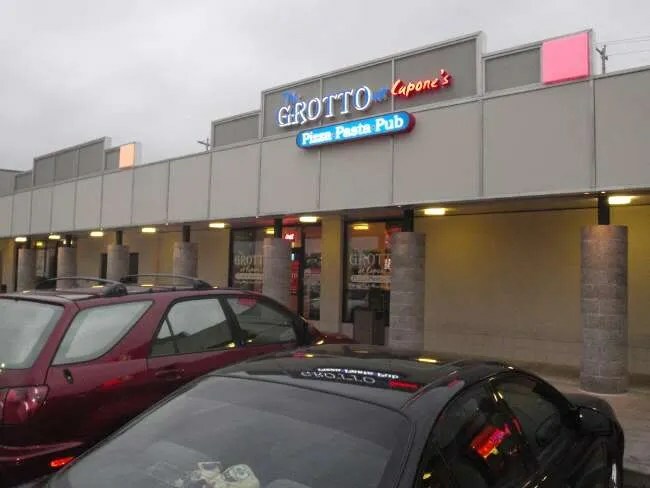 The Grotto at Capone’s is a great college hangout kind of bar. It’s close to campus. They have a great menu and a good drinking atmosphere. The whole concept is a Chicago-Style eatery with a mobster theme. They have the sausage patty pizza and an Italian beef (I’m kind of an Italian beef snob, so I didn’t order it…no one ever does right outside of Chicago). The downstairs bar is set up to supposedly look like a hideout Al Capone would have used, but since it was closed, I didn’t get a chance to see it for myself. J said she would eat there again as we were walking out and I would throw my hat in that ring as well. A large half cheese, half pepperoni pizza. Thanks for the heads up! I’m pumped to try it. My boyfriend is a direct descendant to some of the mafia family and he’s pretty into the history, so I was thinking about taking him there for his birthday. Was there a lot of Capone type decor there? We stayed upstairs which is a pretty big, open room. There is some on the wall’s. The downstairs part wasn’t open, so I didn’t get a look at that.